The Ministry of Justice works to protect the public and reduce reoffending, and to provide a more effective, transparent and responsive criminal justice system for victims and the public. Each year, millions of people use their services across the United Kingdom, including 500 courts and tribunals, and 133 prisons in England and Wales. We work with many government agencies, including: HM Courts and Tribunals Service, HM Passport Office, UK Visas and Immigration, HM Prison and Probation Service, Legal Aid Agency, Office of the Public Guardian, and Youth Justice Board. Click here to view our Ministry of Justice letter of Accreditation. ISO 17025 is the global standard for the technical competence of calibration and testing labs. As a laboratory accredited to ISO 17025:2005, Endeavor DNA, Inc. has incorporated an overall system for technical and quality management. This results in superior laboratory practices and customer service. We have implemented the ISO 17025 quality system in our laboratory and are fully accredited as of May 2016. Our Quality Management Statement: Management is committed to being very aggressive in our attitude towards quality of our testing in servicing our customers, good professional practices and customer service, primarily since we want to be ranked as the “best” in our business. Our employees remain clearly focused on the Quality System so they may effectively implement the policies and procedures in their casework and quality control functions. Click here to view our ISO 17025:2005 Certificate of Accreditation. A2LA is a non-profit, non-governmental, public service, membership society whose mission is to: meet the needs of both laboratories and their users for competent testing; improve the quality of laboratories and the data they produce; and increase acceptance of accredited laboratory data to facilitate trade, based on internationally accepted criteria for competence (ISO / IEC 17025:2005). We are one of only a handful of DNA testing laboratories actually accredited by the AABB (previously known as the American Association of Blood Banks). Accredited laboratories have passed a rigorous review and inspection of their testing processes and laboratory to insure that tests are being done accurately and thoroughly. Accredited laboratories also participate in proficiency tests and are re-inspected bi-annually. Only an AABB-accredited DNA laboratory is authorized to perform court admissible testing in the USA and provide testing services for the U.S. Department of Homeland Security as well as the U.S. Citizenship and Immigration Services. If you need AABB Accredited DNA testing, please visit our U.S. website. Click here to view our AABB Certification of Accreditation. The EU-U.S. Privacy Shield Framework was designed by the U.S. Department of Commerce and European Commission to provide companies on both sides of the Atlantic with a mechanism to comply with EU data protection requirements when transferring personal data from the European Union to the United States in support of transatlantic commerce. The Privacy Shield program, which is administered by the International Trade Administration (ITA) within the U.S. Department of Commerce, enables U.S.-based organizations to join the Privacy Shield Framework in order to benefit from the adequacy determination. Click here to verify our participation with the EU-U.S. Privacy Shield Framework. The College of American Pathologists, the principal organization of board-certified pathologists, serves and represents the interest of patients, pathologists, and the public by fostering excellence in the practice of pathology and laboratory medicine. 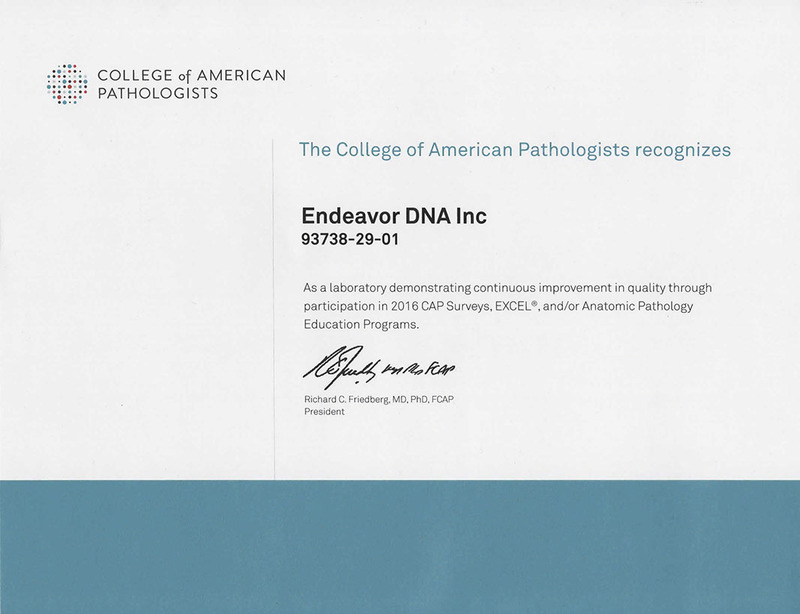 Endeavor DNA, Inc. is a member of CAP, and participates in its proficiency testing program. Click here to view our current CAP Certificate. GBSI’s mission is to promote the use of best practices and standards to improve the quality of life science research. As a non-profit organization, GBSI is dedicated to enhancing the quality of biomedical research by advocating best practices and standards to accelerate the translation of research breakthroughs into life-saving therapies. Click here to verify our Cell Authentication Alliance Membership. In light of the amendment of ISO 9001:2008, the International Accreditation Forum (IAF), the International Laboratory Accreditation Cooperation (ILAC), and the International Organization for Standardization (ISO) have issued a revised communiqué declaring that the management system requirements of ISO/IEC 17025 meet the principles of ISO 9001:2008. ILAC has issued a covering letter dated 8 January 2009, explaining the rationale for the communiqué. The arrangement came into effect on 31 January 2001. The ILAC Arrangement provides significant technical underpinning to international trade. The key to the Arrangement is the developing global network of accredited testing and calibration laboratories that are assessed and recognized as being competent by ILAC Arrangement signatory accreditation bodies. The signatories have, in turn, been peer-reviewed and shown to meet ILAC’s criteria for competence. Now that the ILAC Arrangement is in place, governments can take advantage of it to further develop or enhance trade agreements. The ultimate aim is increased use and acceptance by industry as well as government of the results from accredited laboratories, including results from laboratories in other countries. In this way, the free-trade goal of “a product tested once and accepted everywhere” can be realized. A list of the ILAC-MRA signatories and the scopes of accreditation we are accredited to due to our ISO/IEC 17025:2005 accreditation through A2LA (Testing certificate 4049.01) can be found here. Commerce on the Internet is currently an unregulated marketplace, making it difficult for customers to recognize legitimate online offers. We are accredited with the Better Business Bureau’s Reliability program. This accreditation means we adhere to high standards of business practices. Click here to verify our membership and check our rating. NMBio, a BIO affiliate, is New Mexico’s statewide trade association for biotechnology, biomedicine, biosciences, and related industries. Established twenty years ago, the association provides a forum for information exchange, develops initiatives to enhance business success, offers education regarding bioscience in the State, helps establish collaboration, and serves as a voice of the industry to State, Federal and local governments. We are proud to be an active NMBio Member.